"The first time worship was mentioned in the scriptures had to do with Abraham poised to give up his most treasured possession. Worship isn’t just about singing. It’s about giving up the dearest things to us." 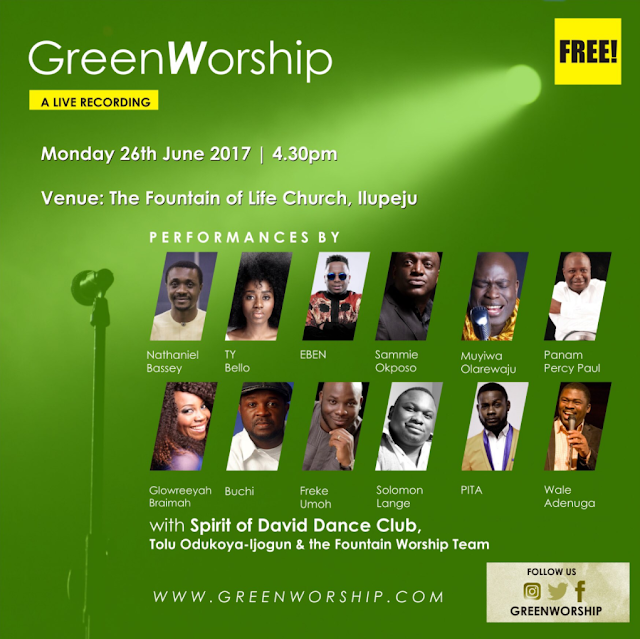 On the 26th of June 2017, twelve of Nigeria’s finest Christian artistes and the Spirit of David dance group are coming together to initiate a live recording project that will make a tangible impact in the lives of thousands of orphans and children with special needs in Nigeria. This is a Worship for Change initiative. In an radio interview with the convener, Wale Adenuga, on Praiseworld Radio’s breakfast show "The Praise O’Clock Show", he said that "We are doing a live recording with 13 artists! So basically we are trying to do an offering of worship for Nigeria being that Nigeria’s color is ‘Green white Green’. Beyond this we intend to take Green Worship Global." He added that all the artistes were performing free and that the profits that comes from the live recording concert will go straight to 5 different charities.